Andrew Allen is a Canadian singer/songwriter signed to Epic Records. Amongst his inspirations Allen counts Jason Mraz, Maroon 5 and Jack Johnson - all three of whom you can hear in his single, "Loving You Tonight." Originally released in June of last year, this version of the single is new for the upcoming album. Allen first rose to prominence in his native Canada when "I Wanna Be Your Christmas" went Top Ten back in 2009. When "Loving You Tonight" was originally released the single went Top 10 on radio and Top 100 in iTunes, thanks in part to CHUM Radio's Emerging Artist Initiative. Earning a handful of awards including “Best New Artist of 2008” (BCIMA’s), “2009 Singer/Songwriter Award” (We Are Listening), 2009 Finalist in the John Lennon Songwriting Competition, “Single of the Year” (BCIMA’s - 2009), “Pop Recording of the Year” (BCIMA’s - 2009) and “People’s Choice Award” (BCIMA’s – 2009)- clearly Andrew Allen is loved in Canada. Now, with the release of this new single and Mark Staubach-directed video, here's hoping he gets some love here in the States. 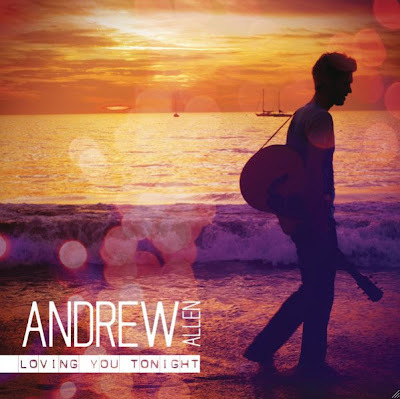 Download "Loving You Tonight" on iTunes HERE. Aussie singer/songwriter Lenka has really great lips. I know that's an odd way to start out a post but I can't stop staring at them in the new music video for "Heart Skips A Beat," the upcoming third single taken from her upcoming sophomore album. Due out April 19th on Epic Records, Two is the follow up Lenka's 2008 self-titled debut which peaked at #58 on the UK Albums Chart and at #142 on the Billboard 200. While Lenka's debut single, "The Show" also managed to chart, all the way up to #22 on the UK Singles Chart - all subsequent singles failed to make any impact at all. Sad, really, considering Lenka's talent. Lenka is absolutely stunning, resembling a cross between Mandy Moore and Sarah McLachlan. Vocally, she's a pleasure to the ears, recalling the styles of Sara Bareilles, Colbie Caillat and fellow Aussie Kate Miller-Heidke. Her delivery is crisp and clear, her tones beautiful. Watching her sing is also a joy (partially because of her beautiful lips). "Heart Skips A Beat" is the third single off of Two. "Roll With The Punches," single number one, was released last November. On February 8th Lenka released a second single, "Everything At Once." No word yet on when "Heart Skips A Beat" will be released but hopefully soon. It's my favorite single so far from Lenka's second album. Check out the video for "Heart Skips A Beat" below. Check out Lenka's music on iTunes HERE. Mutya Buena (along with Keisha Buchanan) might very well be the best thing to ever come out of UK girl group, the Sugababes. A complete original, Mutya Buena parted ways with the group in 2005, leaving the very capable Keisha Buchanan to hold down the fort, as the last of the original line up. In 2007 Mutya released her debut solo album, Real Girl, which debuted at #10 on the UK Albums Charts and spawned two Top Ten singles before ultimately being dropped by Universal due to poor sales. While we've heard peeps out of her sporadically since leaving her label, the future of her music career seemed to be in question, after an interview last October with InTheNews.co.uk where Mutya announced that she was going back to school. You definitely have to applaud the talented singer for following her hopes and dreams, although secretly I was dying inside at this news. Well, we can all breathe a sigh of relief (for now) because Mutya is back stronger than ever. Featuring on a new dance track from Ministry of Soundʼs 2009 Best Breakthorugh DJ, Paul Morrell Mutya does what she does best. The high energy dance single, "Give Me Love" has yet to be released but DID appear on a compilation CD at the end of December remixed by Hoxton Whores. The single will be backed with remixes by Fabio Stien, Reset The Preset, Tripwire and Hoxton Whores. Sounds pretty epic to me. Check out the video for the single below. "Give Me Love" marks Morrell's return to New State/Maelstrom Records, a professional collaboration last heard back in October with the release of the Sonique-assisted "Only You." Let's hope this is a sign that Mutya is plotting a return to music. Let's also hope that it get's an official release date soon. "Don't Hold Your Breath" is a sure-fire SMASH. No doubt about it. The second single released off of ex-Pussycat Doll Nicole Scherzinger's forthcoming debut album, "Don't Hold Your Breath" was produced by American remixer extraordinaire Dave Audé, who also produced for the Pussycat Dolls back in the day. The song is an infectious club track, sure to bring all of the boys onto the dance floor whenever it comes on. With a massive remix package featuring mixes by The Alias, Cahill and Bimbo Jones, "Don't Hold Your Breath" is going straight to the top of the UK Dance Chart. The single, a follow up to last Fall's moderately successful "Poison" is due out on Interscope Records on March 6th. Nicole's debut album, (tentatively) expected out in March, features production from RedOne and Audé, among others. No word on a U.S. release for the new single or album but a boy can dream, right? UK fans can check out the video below (U.S. fans click HERE for the video).